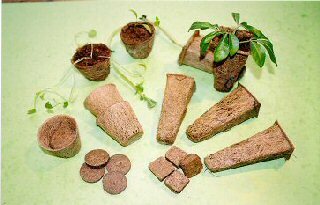 These are little organic coir fibre pots, each of which contains a cube or disc of compressed coir compost. All, of course, totally renewable, totally sustainable. Just add warmish water and watch the compost expand to fill these hand made pots. 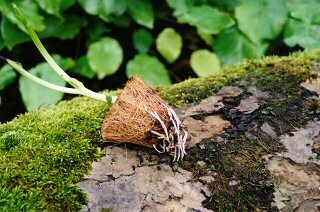 Add a seed or cutting and give your plant the greenest possible start in life. We would suggest giving a bit of oomph when your plants get going with our organic fertiliser from the almost mythical Neem tree (Azadirachta indica ). Then if you really want to spoil these young plants (and we do) pop them into the ground after treating it with our all natural seaweed, carefully and sustainably harvested by an organic farming family in the Shetlands. 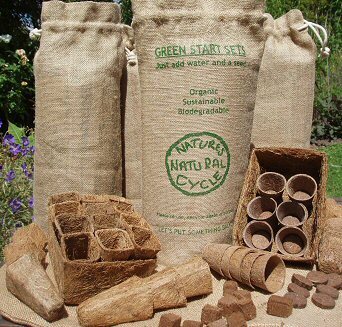 A children’s garden can grow for a lifetime, and these ‘Green Start’ organic sets can set them on a path of sustainable, biodegradable gardening. This year the children in our family have enjoyed germinating sweet corn and loads of other stuff in these little compost filled pots . It’s so simple this ‘nature’s way’ thing. Not that these sets are just for children. They are ideal for starter growth for nearly all plants, allowing planting out - or on to bigger pots -with minimal upset to the young plant by planting ‘pot an all’. 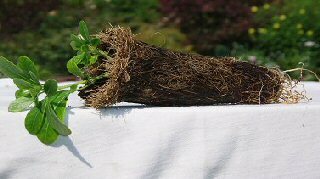 Great for those seedlings which dislike root disturbance. The ‘Root Runner’ sets are designed for plants requiring a long root run - for example, sweet peas, beans or shrub cuttings, the seedling ‘Green Starts’ for anything you fancy. Simply do not know why, but the cubes of compressed coir compost expand best with warmish water. The compressed compost discs are not so fussy, any temperature will do !